Throughout the Scriptures, terrible times are forecast for the end of this present age. Isaiah describes the earth “empty and wasted” (Isaiah 24:1). In the book of Revelation we read of an “hour of trial” which shall come upon the whole world to test those who dwell on the earth (Revelation 3:10). 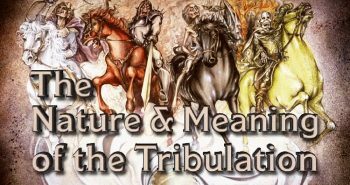 The Lord Jesus, in the gospel of Matthew, warns us of a “great tribulation” which shall threaten the survival of all life on earth (Matthew 24:21,22). The apostle Paul speaks of sudden destruction that shall come just when men are saying “peace and safety” (1 Thessalonians 5:3). As these verses indicate, the Scriptures (along with current events) make it plain that world conditions will be characterized by chaos, destruction, and death just before our Lord returns to take control of planet earth. In the book of Revelation we read of the poisoning of the oceans, the burning up of the grass and the trees, and the sun scorching people with great heat. The book also tells us that horrible plagues will afflict mankind, that there will be widespread wars and famines, and that the atmosphere will become so polluted as to reduce visibility by one third. In the midst of all this devastation, the earth’s population will flee to the caves, as people cry to the mountains and rocks, “Fall on us and hide us from the face of Him who sits on the throne and from the wrath of the Lamb!” (Revelation 6:16). 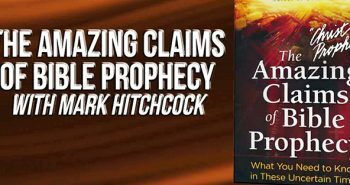 1) Supernaturally — First, it could be that the great and terrible destructions predicted will be brought about supernaturally by God Himself without any other possible explanation. Until the nuclear age this was the primary view, as it was hard to see how such a scenario could be brought about by natural human means. In the Old Testament we find God killing 185,000 of Israel’s enemies by one angel, without any natural explanation. If one angel can wipe out that many people, it should not be too much trouble for all the hosts of God’s angelic armies to destroy three quarters of the earth’s population. The Apostle John’s description of the sun becoming black as sack cloth and the moon becoming like blood perfectly describes the phenomena that would result from massive amounts of dust and debris blown into the sky by multiple nuclear bursts. “And the atmosphere was pushed apart like a scroll when it is rolled together” (Revelation 6:14). 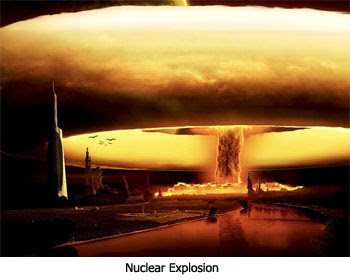 Do you know what happens in a nuclear explosion? The atmosphere rolls back on itself! It’s this tremendous rush of air back into the vacuum that causes much of the destruction of a nuclear explosion. John’s words in this verse are a perfect picture of an all out nuclear exchange… The whole world will be literally shaken apart! 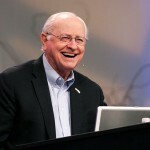 As we read the book of Revelation, we find John did not use terms like “nuclear weapons, ICBM’s, or fractional orbital bombs.” Instead we find him describing things like “hail and fire,” “a great mountain burning with fire,” and “a great star… burning like a torch.” This is what we would expect of a First Century man, describing things he had no knowledge of in the only terms he knew to use. 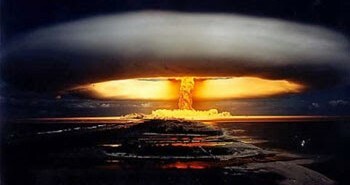 Could it be that what John was really witnessing in the Spirit, was an end of the age nuclear holocaust? The effects he describes certainly seem to bear this out.